Screenshot/CNNDavid Hogg speaking on CNN. Some on the far right are going after a survivor of last week’s school shooting in Parkland, Florida, who has recently made multiple appearances on TV-news outlets. The student, David Hogg, whose father is a retired FBI agent, has been critical of President Donald Trump and other politicians for their response to the shooting. Trump’s eldest son, Donald Trump Jr., liked a pair of tweets questioning the student’s motive for speaking out about the shooting. Some of President Donald Trump’s most fervent supporters have started going after a survivor of last week’s shooting at a high school in Parkland, Florida, who has since made a series of appearances on TV-news outlets. 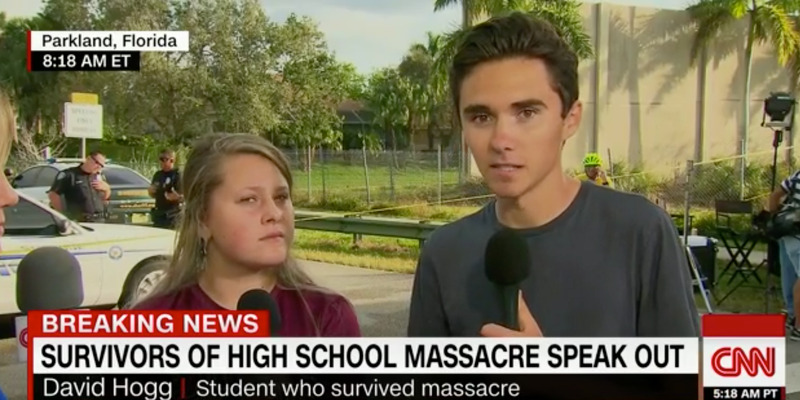 That student, David Hogg, has been featured on CNN and CBS following the shooting at Marjory Stoneman Douglas High School that left 17 people dead and more than a dozen others injured. Some far-right outlets have pointed to Hogg’s father’s being a retired FBI agent to suggest something nefarious in the student’s frequent media appearances. The stories gained even more attention when Trump’s eldest son, Donald Trump Jr., liked that tweet and another post sharing the True Pundit story. Echoing a prominent conspiracy theory swirling in some right-wing circles on the internet, Trump claimed over the weekend that the FBI missed warning signs about the Florida gunman because of its investigation into Russia’s interference in the 2016 US election and whether his campaign colluded with Moscow. The FBI has more than 35,000 employees and runs hundreds of investigations simultaneously, and a special counsel outside of the Justice Department is leading the Russia investigation. The bureau, however, acknowledged last week that it failed to follow protocol in following up on a tip last month about the suspect in the Florida school shooting. Trump has repeatedly accused leaders within the Justice Department and the FBI of being biased against him.